Tango Fire is certainly flaming hot in talent and delivery! All dancers are presented in meticulous and fussy embroidery that is most evident when they sweep the stage’s floor with swashbuckling Tango sequences. 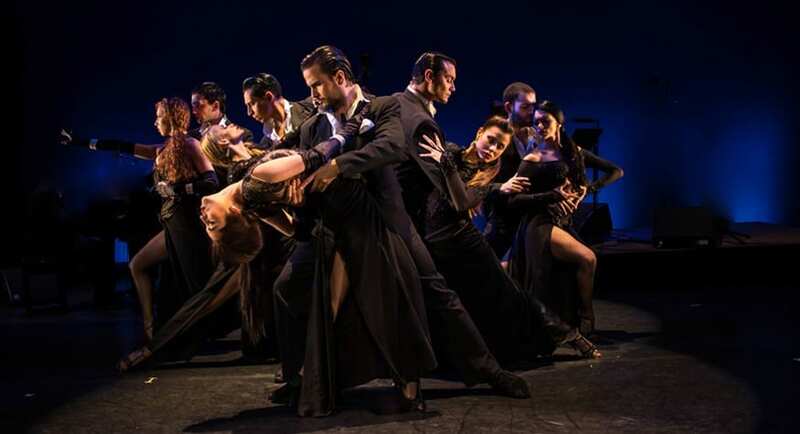 Tango comes in the dozen (six couples) with Argentina’s finest starring in acts that cover all the terms of the Tango glossary. They are complemented by a band (Quarteto Fuego) who have a rich background in sensationalising Tango through music. The storied choreographer, German Cornejo certainly is befitting of his first name with ‘German’ efficiency at the forefront of this production. Indeed, he partner’s up with Gisela Galeassi and sends her coasting around the floor fluently with a remarkable touchdown finish. The first half of the show at Sadlers Wells Peacock Theatre presents Tango in a rendezvous setting, with couples mingling in classy bars and performing cabaret on chairs. In the second half, Fantasia (sometimes referred to as ‘Exhibition Tango’) is prevalent with intimate swirling and daring leg intertwining movements that makes a nutmeg in football look very ordinary! In the closing minutes of the show, a plea was sounded out by the cast to the audience in the words of ‘do you want more’. If ever there was a rhetorical question, it was greeted with a sellout approval. This resulted in audience participation on-stage that demonstrated how all sorts can get ‘tangoed’ up in the Tango Fire! « 2 Great Books; 1 in Kent, 1 in Sussex.